This week is final exam week for 1st semester. School will dismiss at 11.30AM during the final exam week so no bento for lunch as the kids will eat at home after school. This small portion bento was however prepared for Little A because he will finish the exam at 11.00AM, so there is half an hour wait for his sister. I got this 2-tiers round box from Sanrio. They are pretty small and just perfect for my kid's small portion bento. I'm still on Christmas theme bento. Hope I can do some more before the school break comes. I have been thinking to make an angel since last night so I can use the wing picks again. I haven't use my wing shapes food picks for a long time. I might just have a little time to get online this week, pretty occupied with the final exam things. Pray that the kids will do well in their final exam and looking forward for the school break & Christmas holiday very soon :) Inside the boxes : rice sprinkled with furikake (decorated with Christmas angel from egg sheet, nori, wing shapes food picks), braised thin sliced pork belly & egg, and stir fry bean sprouts. The angel is so sweet...!! Jealous that you have so many bento gadgets/boxes, etc ;)! Good luck to your kids' exams, I am sure that they're going to do well with such a supportive as you :)! I am glad that I don't have to do those tests/exams anymore, so nerve-wrecking...;)!! Looking forward to seeing more of your X-Mas themed bentos :D)! 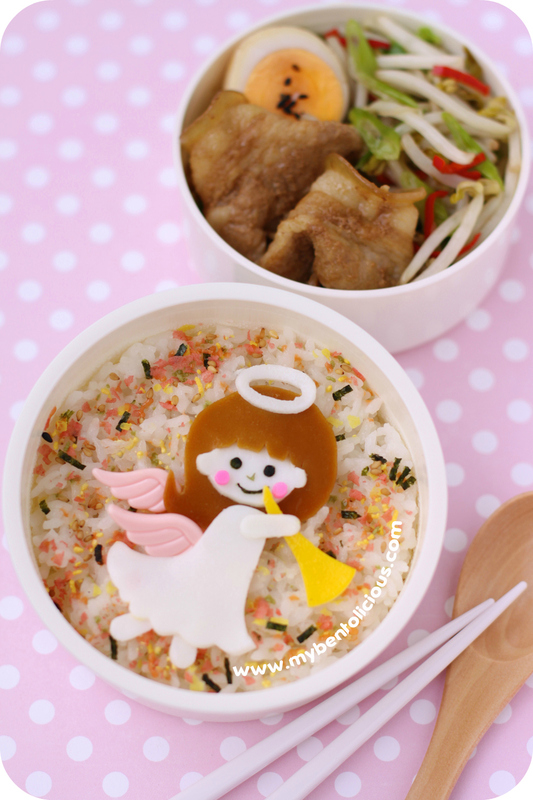 This bento is just so lovely, and your style of parenting is very inspiring! Well done super mommy! @Cooking Gallery : Thanks a lot Sin! Hope nothing is wrong with my comment box. I didn't see your comment earlier though on my dashboard. I have been cut down my bento stuffs shopping a lot this year. Not so 'crazy' shopping like before. I try to pick something that really useful for my bento making. Otherwise the bento stuffs will be everywhere in the house LOL :D I'm glad that Big A can study and do the review by herself, but Little A still need my help for some subjects. Is like going to school all over again except these days lessons are harder than my time. So uplifting and lovely, Lia! Best wishes for your beautiful children at exam time! Nice to see this lovely bento first thing I'm back to bento blogs! I wonder if I'll miss making Christmas theme bento as my boy is already back to hometown enjoying his long holiday!